Lucid Grey, as you see it, culminated in 2003 in Lexington, KY. Through its earlier humble beginnings as a power trio, it evolved into a five piece. It developed with the contributions of past members until it became Greg, Blue, Clark, Justin, and Billy again in 2008. The chemistry was complete. The new era started. In 2000 the Lucid Grey (power trio) released the debut “Tension and Release” that showed the diversity of the member’s influences and the potential for great things to come. 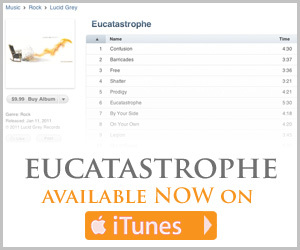 In 2004 Lucid Grey released the “Out of Focus” EP that received great reviews and landed them with media exposure. MTV’s 2004 Road Rules licensed the entire EP and featured multiple songs in the episodes. In 2006, Lucid Grey’s earlier version of “Shatter” was featured on Lion’s Gate Films “Tamara”, a thriller from Jeffrey Reddick (writer of Final Destination I and II).